Rutgers Suspends 5 Football Players After Arrests On Assault Charges : The Two-Way Police have arrested five Rutgers players and four others, accusing them of crimes that range from assault to home invasion and rioting. After five football players were arrested Thursday, Rutgers University suspended the group. Two other former players are also suspected of crimes that range from assault to robbery. Here, the school's board of governors is seen in a meeting this summer. Two days before its football season kicks off, Rutgers University has suspended five current players who are accused of a variety of crimes, from assault to home invasion. 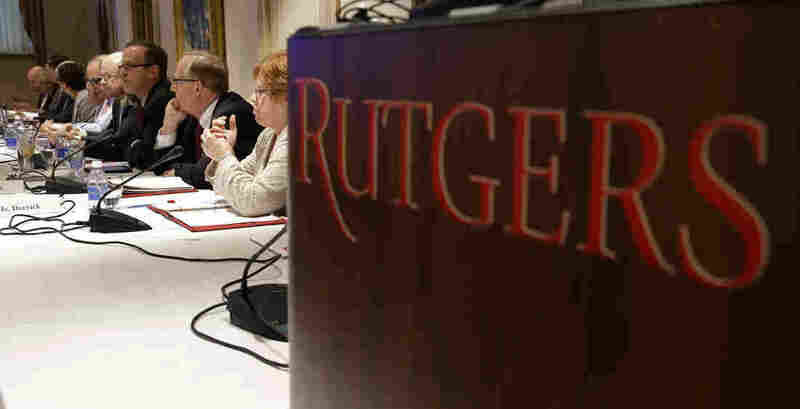 Local authorities arrested the players Thursday; two former Rutgers players also face charges. Many of the allegations stem from robberies this spring, in which money and marijuana were stolen from students; others are related to an attack on a group of people that left a 19-year-old student with a broken jaw. The football players are among 10 young men — including other Rutgers students — who were arrested Wednesday. Police say one suspect, former defensive tackle Daryl Stephenson, remains at large. "Five of the men were charged in home invasions — including armed attempts to invade dorm rooms — in which they targeted other students for their drugs and money," the news site North Jersey reports, citing a news release from the Middlesex County Prosecutor's Office and New Brunswick Police. One of the players arrested on assault charges, cornerback Nadir Barnwell, 20, was already involved in another Rutgers controversy, as the school has been investigating reports that head coach Kyle Flood broke the rules by contacting a professor about Barnwell's grades. "The students involved are currently suspended from our program. We continue to monitor the situation. We will have no further comment as this is a pending legal matter." "Former player Tejay Johnson was charged with robbery, criminal restraint, theft and possession of a weapon for an unlawful purpose stemming from a home invasion in New Brunswick on April 26, 2015. "Johnson and current cornerback Andre Boggs were charged with robbery, burglary while armed and conspiracy to commit an armed robbery for allegedly forcing their way into a home and, armed with a bat and a knife, [robbing] a student of approximately $900 and an undisclosed amount of marijuana on April 27, 2015." In all, the police say Johnson and Boggs carried out three home invasions, including one case in a dorm in which the targeted students locked their door, foiling a robbery attempt. Three other people also face charges in those cases, accused of either helping to plan the crimes or of driving a getaway vehicle. Johnson is a former wide receiver and cornerback whose athletic career was ended by injuries last summer. At the time, Flood said Johnson would remain involved with the Rutgers football program. In the assault case, prosecutors have charged Barnwell and Johnson, along with cornerback Ruhann Peele, fullback Razohnn Gross and safety Delon Stephenson (along with Stephenson's older brother, Daryl) with aggravated assault, riot and conspiracy to commit a riot, according to a statement from law enforcement.